As much as I like the Ted Kord Blue Beetle, I’m still a fan of Jaime Reyes. The post-Infinite Crisis stories worked as a genuine way of introducing a new character, while the New 52, and even the Rebirth ones, didn’t really seem to gel for some reason. 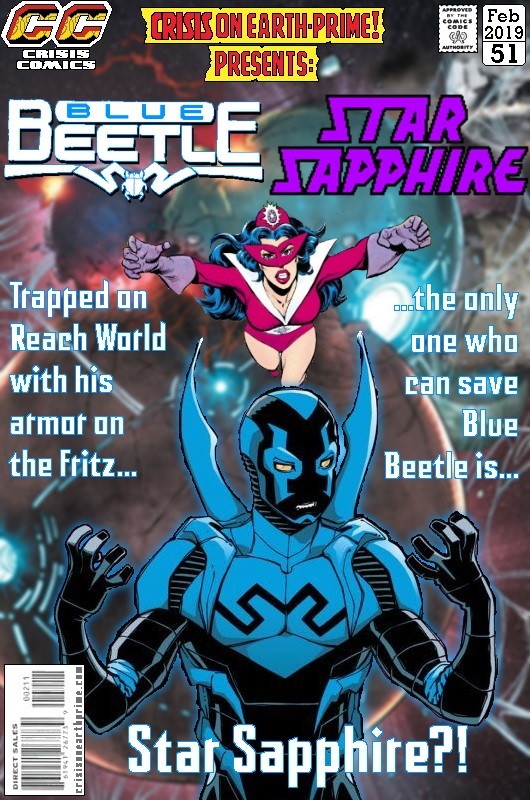 Posted on Wednesday, February 13, 2019 Tuesday, January 29, 2019 by GaryPosted in Mash-UpTagged Blue Beetle (Jaime Reyes), Star Sapphire. Next Next post: Happy St Valentine’s Day! I have a mild interest in him, and I did like his portrayal in Young Justice, but Ted Kord will always be the real Blue Beetle to me. Nice image of Star Sapphire btw. Where’d you find it? Yeah, Ted was my Blue Beetle as well. Jaime’s introduction after Infinite Crisis seemed natural, though, but post-New 52 his series never really worked as well as they should. Star Sapphire’s from Green Lantern #192 from 1985. You’d think with Giffen writing it it would’ve been a surefire hit.